(Nov. 12, 2018) -- Commencement is the icing on top of the collegiate journey for students at UTSA. Before crossing the stage to receive their diploma at the Alamodome, many UTSA students celebrate academic milestones through various colleges and organizations which helped them to chart their path to success. Below is a sampling of a few of the graduation ceremonies that make UTSA so unique. The UTSA Office of Undergraduate Admissions and Scholarships Office celebrates graduates who have successfully completed the Distinguished Scholars program. Each student receives a special stole to proudly wear at Commencement. Ujima is the third of seven principles of Kwanzaa and stands for collective work and responsibility, and to build and maintain a community together. This ceremony celebrates the accomplishments of UTSA’s African, African-American and black students. This graduation ceremony recognizes and honors all UTSA students who fall under the LGBTQ umbrella for their hard work and academic accomplishments. 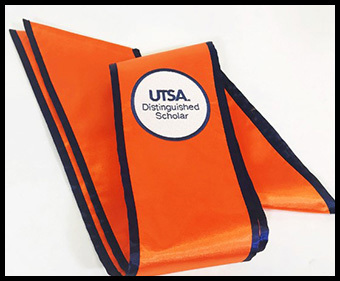 >> Learn about the various academic regalia and other information about UTSA Commencement. 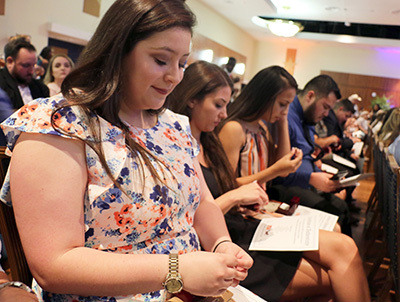 One of UTSA’s most memorable traditions when hundreds of Roadrunners will receive their class rings. Before the rings arrive at UTSA, however, they make a special stop to spend a night in Texas’ most iconic landmark, the Alamo. Clinical teachers (formerly student teachers) are inducted into the profession of teaching and receive a special certificate for the completion of their clinical teaching. The College of Education and Human Development Dean, Associate Deans and Director of Clinical Teaching provide a few words to the students, and the graduate watch a video that showcases their journey at UTSA. This ceremony recognizes College of Sciences Ph.D. students who are graduating this semester. They also receive a gift from the college. Graduating seniors take an oath then receive an Order of the Engineer ring from another Order of the Engineer alumni. They also sign the guest book and receive a certificate. The Honors College Stole and Laurel Ceremony celebrates Honors College graduates with the awarding of an Honors Stole, individual announcement of future plans, thesis and major advisor, as they walk across the stage. Engage in learning and discovery with UTSA academics.